ATV vehicles are extremely popular recreational vehicle in Illinois. ATV vehicles are also known as all-terrain vehicles, quads, and four wheelers. These outdoor recreational vehicles can lead to serious injuries or even death. As experienced Chicago ATV accident lawyers we have handled many accident cases involving ATV and quad vehicles. In 2006, 555 ATV-related deaths were reported to the U.S. Consumer Product Safety Commission. Over 100 children died in ATV accidents in 2006. The Consumer Product Safety Commission estimated that over 146,600 people were treated in emergency rooms for ATV-related accidents in 2006. Accidents involving these vehicles commonly cause the victims to fall or to be thrown off from an all-terrain vehicle. Victims can suffer such injuries as Traumatic Brain Injury (TBI), spinal cord injuries, fractures and broken bones. Often times, ATV accident injuries have resulted in death. If you have been injured by an ATV vehicle, you may be entitled to compensation for medical bills, vehicle repairs, pain and suffering, loss of earning, and future loss of earnings. In the event that a death has occurred as a result of the ATV accident, you can file a wrongful death suit. 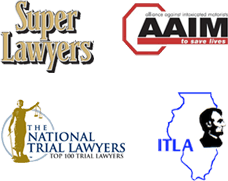 Our Illinois and Chicago ATV accident attorneys are prepared to help you with the legal matters following an ATV accident. The personal injury and wrongful death lawyers at Nemeroff Law Offices represent many victims who are injured or killed by the negligence of others. We will help you recover the money damages you or your family is entitled to. If you or someone you love have sustained injuries or loss from an ATV accident Contact Nemeroff Law Offices today. Our experienced ATV and Quad injury accident attorneys are available to speak with you directly.